To purchase tickets visit ovationtix.com or call 212-352-3101. 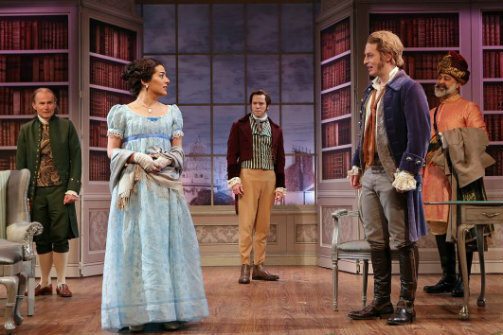 Henry Stram, Nadine Malouf, Christian Conn, Ramsey Faragallah and Christian Demarais in The School for Scandal. BOTTOM LINE: Red Bull Theater adds Sheridan's witty 18th-century acid-laced comedy of manners to its roster of classics. Sheridan’s play about the gossiping and conniving that goes on behind the closed doors of the drawing rooms of wealthy Londoners was likely inspired by his own very colorful life and immersion in major historical moments. Born a few years before King George III took the throne, Sheridan went on to become a member of Parliament for three decades and a supporter of the colonists. He also dueled over his future bride after she, a celebrity, was defamed in print. And before he was 30 he had a hit on his hands with The School for Scandal, which George Washington saw three times. Sheridan has crafted a trio of stories involving a bountiful cast of 14. He sets the tone straight away with the names he gives his characters (including Sneerwell, Surface and Snake). Director Mark Vietor takes this further with modern flourishes, such as having one of the leading ladies, Miss Sneerwell (Frances Barber) audibly make use of the on-stage restroom. Her co-conspirator in troublemaking, Mr. Snake (Jacob Dresch) then proceeds to powder and perfume her undercarriage. Sneerwell, a wealthy widow, is a master of chicanery, entertaining her band of vipers that includes Mrs. Candour (Dana Ivey), Sir Benjamin Backbite (Ryan Garbayo), his sycophantic uncle Mr. Crabtree (Derek Smith), and Snake. None save for Snake, a gossip columnist and critic, would appear to have professions of any sort, and they spend their time sharing stories about others in their monied circle. Not a fan of Sneerwell and her gang is Sir Peter Teazle (Mark Linn-Baker), who is recently married after 60 years of bachelorhood. Lady Teazle (Helen Cespedes) is his significantly younger contemptuous country bride who has quickly grown accustomed to a certain lifestyle that includes joining the gossips. Teazle is trying to marry off his good friend’s daughter, Maria (Nadine Malouf), now his ward and an heiress after her father’s recent passing. Teazle wishes for Maria to marry Joseph Surface (Christian Conn), who everyone looks upon as his family’s upstanding golden boy. Joseph, however, is not what he seems. He’s plotting with Sneerwell and Snake to besmirch the reputation of his younger brother, Charles (Christian Demarais), the object of Maria’s affections. Charles is a kind-hearted profligate burdened with considerable debts mounting. Joseph wants Maria and her money for himself while Sneerwell has designs on Charles. The rivalry between the brothers and their true natures is investigated by their uncle, Sir Oliver (Henry Stram). A generous man, Sir Oliver has long supported Joseph and Charles, and returned after more than 15 years away. His nephews are largely strangers to him aside from the tales he’s heard. 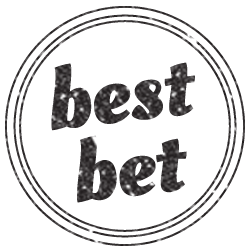 Oliver is aided by his friend Master Ranji (Ramsey Faragallah) and Teazle as he seeks to find out if Charles, his favorite, has any redeeming value. If after reading about the many characters and their shenanigans you need to have a lie down, know that the plot threads largely hold together without tipping into the absurd. I have to admit to being a little confused about Miss Sneerwell’s motivations regarding Charles and Maria because the beginning of the play takes off like a shot. Also, Sneerwell doesn’t show any romantic feelings toward him. But perhaps in the 18th century an older woman with lust in her heart couldn’t get a break either. The rest of the cast is uniformly excellent, fleet-tongued as they keep all the parrying and machinations going. Barber and Dresch make for a devilishly dynamic duo and Dresch, sporting a radioactive green wig, fully embraces his character’s moniker as he slinks and glides about. Stram effectively straddles comedy and pathos as he goes from disguise to disguise and struggles to continue giving Charles the benefit of the doubt. Special mention goes to Ben Mehl, who memorably plays four (!) servants, adorned with his own vivid, follicle masterpieces and accompanied by assorted accents. He has great comedic timing as he enters and is hustled out of rooms by his various employers. Vietor deftly incorporates contemporary touches such as the over the top costumes and wigs and having a self consciously “Indian” musical cue every time Ranji enters that help the show to feel just as relevant to Twitter and Buzzfeed-loving audiences as it was to the British nearly 250 years ago. Anna Louizos, Andrea Lauer and Charles G. Lapointe all do a fantastic shop with the sets, costumes and wigs, respectively. The ensembles and bouffant ‘dos are really spectacular. If you like your classics with more than a bit of bite, get schooled before the show closes next Sunday. The School for Scandal is written by Richard Brinsley Sheridan and directed by Marc Vietor. Scenic Design is by Anna Louizos. Costume Design is by Andrea Lauer. Lighting Design is by Russell H. Champa. Hair and Wig Design is by Charles G. Lapoint. Original Music and Sound Design is by Greg Pliska. The cast includes Frances Barber, Helen Cespedes, Christian Conn, Christian Demarais, Jacob Dresch, Ramsey Faragallah, Ryan Garbayo, Bradley Gibson, Dana Ivey, Mark Linn-Baker, Nadine Malouf, Ben Mehl, and Derek Smith and Henry Stram.